The leaves are mostly gone from the deciduous trees around our house, many of them stuffed in the gutter. (Have to do something about that.) It’s still sometimes warm enough to hike with only a sweatshirt, but that’s one of the false, temporary good things about climate change. But the temperature can’t fool me–it’s almost winter. This morning, my husband put on a CD by Ulaan Kohl, one of the incarnations of Steven R. Smith. (Smith is also responsible for Hala Strana.) Perfect choice. For me, fallintowinter is the season of Dead Can Dance and Hala Strana. I love the introspection and moroseness in this music; it’s so clashingly rich. Along with warm sweaters, extra cocoa, and stout beer, music like this weaves the tapestry I can hang on through winter. In my house, there’s an imagined scenario. It goes a little something like this: At a family reunion, or holiday party, Lisa Gerrard‘s aged auntie says to her, “Lisa, can’t you write something a little more upbeat? You know, for the kids?” Lisa just looks at her. These people will also be invited to teach in the department of Interdisciplinary Aesthetics. But only in winter. This entry was posted in Uncategorized and tagged Dead Can Dance, Hala Strana, Interdisciplinary Aesthetics, music, Ulaan Kohl. Bookmark the permalink. You betcha! Just let me know which season and which class you want to teach. 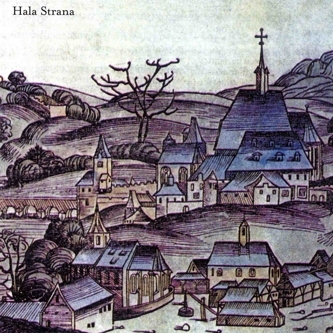 How did you hear of Hala Strana? A friend of mine played their first CD for us awhile ago, but otherwise I have no idea how we might have stumbled onto them. I checked iTunes on your recommendation of Hala Strana as good music to enjoy during these dark and gloomy days of late November. Interesting music always helps when writing or doing research. Thanks for the groovy recommendations!! Going to purchase a few CDs on iTunes today. LOVE Dead Can Dance. I saw them in Cleveland in 1995-ish — one of the best concerts I’ve ever seen. Amazing. Have not heard of Hala Strana – will have to check ’em out on lala.com. This is me totally jealous that you saw D-C-D. That must have been terrific!